SYNOPSIS: George Mallon, recipient of the Medal of Honor, was a powerfully built man with the courage of a lion. The son of an Irish immigrant, he grew up on a wheat farm in rural Kansas, immediately adjacent to the eastern edge of Fort Riley. He served in the regular army in the Philippine War, rising to the rank of sergeant. Captain George Mallon led a company of infantry in the assault on a formidable German position on the opening day of the World War’s Meuse-Argonne Offensive. Days later, he was badly wounded. 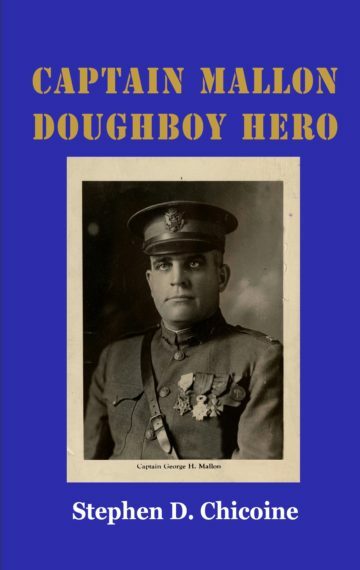 He became one of Pershing’s 100 Heroes of the war. However, George Mallon’s life was so much more than his impressive military accomplishments. As a young man, Mallon pursued a promising boxing career. He became a labor leader & organizer and ran for state office in Minnesota. He had the courage of his convictions to improve the life of the working class in a time when those in power considered such a position radical. Thugs and mobs, who harassed and attacked his colleagues, always faded away when Captain Mallon was present. Through all of this, he maintained close friendships with his political adversaries, who, like Mallon, were war veterans. Perhaps his greatest honor was being chosen to be the first to be buried in the newly established Fort Snelling National Cemetery in 1939. Too seldom is there found in one man both physical and moral courage. Captain George H. Mallon combined these qualities as they may have seldom been combined in any one individual – editorial in Minneapolis Labor Review upon Mallon’s death. Lieutenant General Henry Rawlinson, commanding British Fourth Army, and Lieutenant General John Monash, commanding the Australian Corps, agreed that involving American troops in their assault on the German position at Hamel on July 4, 1918 would augment the under-strength Aussies and give some experience to the green Yanks. The concept was to place an American platoon with each Australian company. Major General George Bell, commanding the U.S. 33rd Division, agreed and sent ten companies. Captain Mallon’s E/132 was not among those sent. Somehow, the aggressive Mallon managed to get himself and his first sergeant inserted into the action. This was to be the first time that American soldiers fought under foreign command. On the day before that assault, General John J. Pershing, commanding the American Expeditionary Force, learned of the plan. He was furious. Pershing ordered the withdrawal of six of the companies. Intense negotiations commenced with Pershing insisting that the four remaining companies returned. Communications being what they were, there was no enough time. Mallon was among those, who took a chance and refused to return. In the end, Mallon and his doughboy comrades joined the Aussies in the attack. Mallon seems to have never seen eye-to-eye with Pershing, who, like most generals, did not tolerate anything but complete loyalty.